Heading north out of town I noticed this Datura bush. Each year it looks like it is almost dead and then it surprises me! This is Fort Bragg's smallest park although I don't know if it is actually an official park. 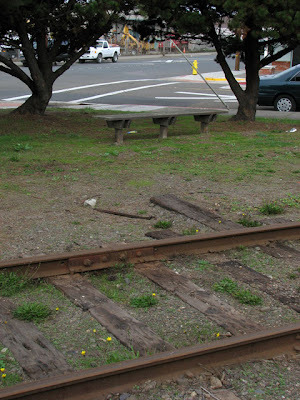 Just two trees, one bench and a perfect viewing spot for the departure or arrival of the Skunk Train! 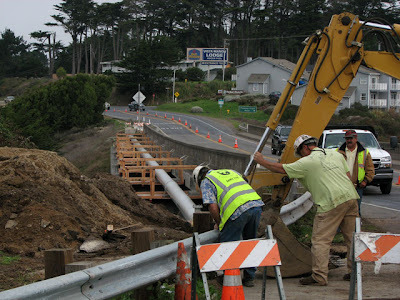 The new "Force Main Project" along side the Pudding Creek Highway One bridge nears completion. 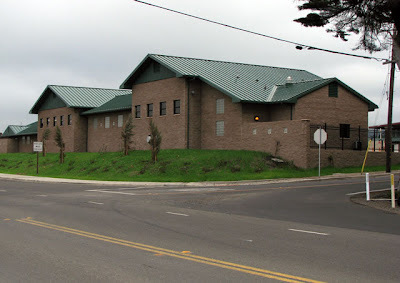 The new Cal Trans equipment and office building nears completion. Colorful plant alongside Highway One. I don't know what it is. Angela commented: The "colorful plant alongside Highway One" is New Zealand Flax (Phormium tenax). That one's likely a hybrid... many varieties available. It's a great landscape plant! 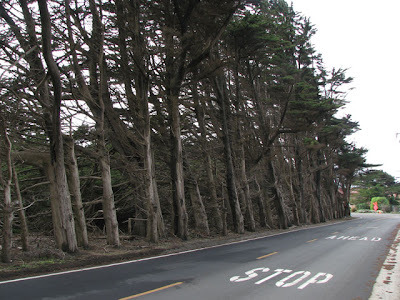 A windbreak of Cypress trees planted years ago. 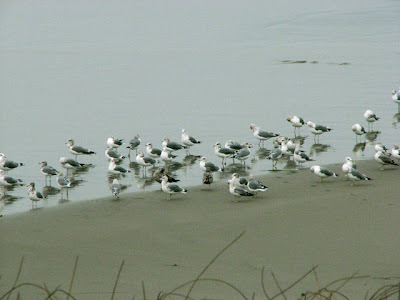 The prevailing northern wind has trained them to lean south. and finally gets his short lived reward for patience. Another example of patience but for what, I don't know. 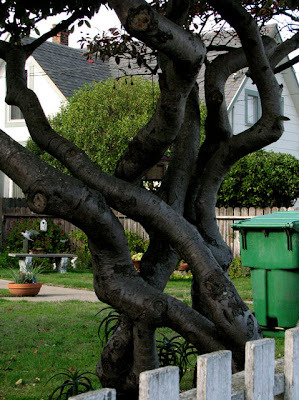 Along my return I found a possible entry for the CTC "Crooked Tree Contest" I am having with "Beating the Bounds". All in all a pleasant walk with threatening rain at the begining and a sunshine finish. 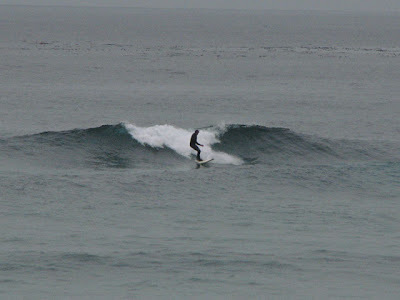 Thanks once again for the interesting pictures and comments about Fort Bragg my home town. I had not been north of town for a few months so I appreciate seeing the new caltrans (road maintainence) building on the corner of airport road. 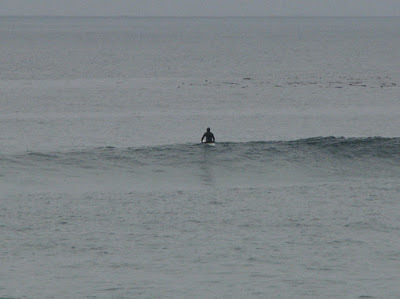 I also was interested to see a surfer out bright and early. 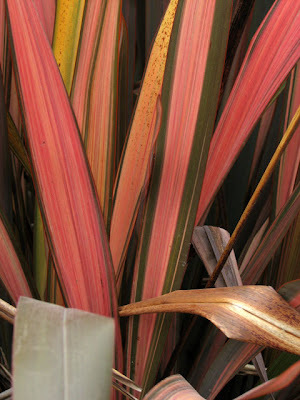 The "colorful plant alongside Highway One" is New Zealand Flax (Phormium tenax). That one's likely a hybrid... many varieties available. It's a great landscape plant! Coincidentally, I picked up a new Phormium on my last trip to your beautiful region... which reminds me... I need to upload some of my Phormium photos from that trip! I did post a few photos of my stop at North Star Nursery here. I love that datura. 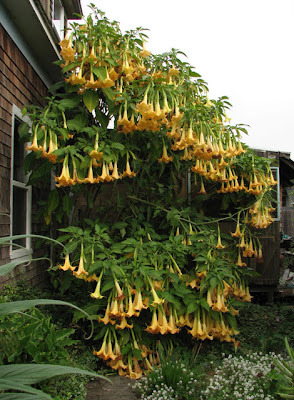 I think those tall varieties are called Angel Trumpets, and have a rich fragrance.